Stocking Up For Summer | Current Favorite (+ Affordable! ) Tank & Accessory Picks at Target Right Now! Rebuilding and finding new pieces for your wardrobe at the turn of any season can often feel overwhelming...especially during the summer! We've all bought something (or several things!) that we only ended up wearing once or twice. Something you don't get much use out of...that "in-the-moment" purchase...you know what I'm talking about. I know I'm so guilty! You try it on, it looks cute, you wear it out, and then you realize it's not the most versatile, everyday item. So when it comes to rounding out a successful, stylish and functional wardrobe for the next few months ahead, avoiding those in the moment impulse buys are going to save you both time figuring out what to wear and money! And the best way to do that is to focus on (drumroll)...shopping the basics! So without breaking the bank, scroll on to discover a few of my recent favorite basics from Target that are giving me a good start to the warm season ahead and are guaranteed to be worn all summer long! These tanks are such a steal considering how many ways you can work them both alone and dressed up. I love the strappy back for summer, the slight V-neck and basic slim fit. I've been pairing them with leggings + my favorite longline cardigan (shop similar here!) for chillier nights or front tucked along with some cute shorts. I purchased the mint + gold color which I love, but I'm now eyeing the black + white ones because you can never have enough of those! 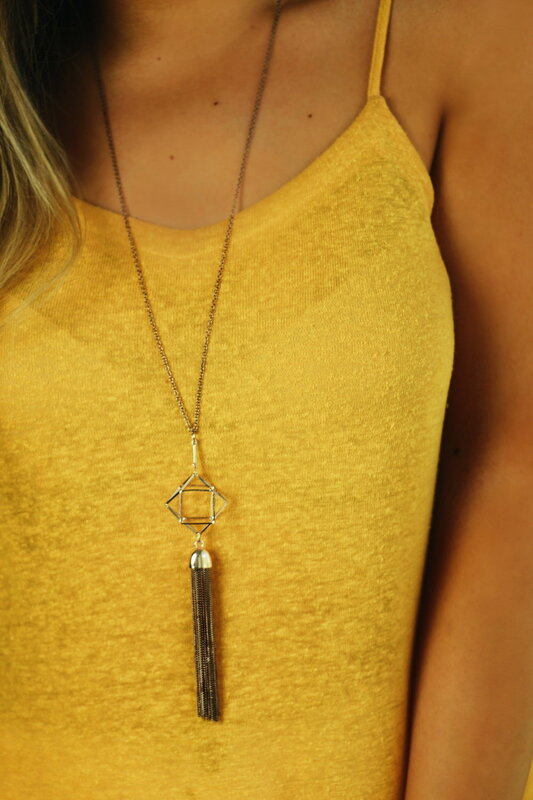 Long necklaces are my absolute favorite way to dress up a basic, and finding a few to go with the tank tops was easy! I don't know about your Target, but mine has totally upped there jewelry section ever since they introduced there new brands. There are literal walls of accessories now versus the few racks they had before! I love the teal and gold in this one! You don't always have to worry about matching perfectly all the time - I've been loving wearing this one against other colors like mustard or coral! It would be a little bit out of the ordinary if I didn't walk out with something rose gold! It's just so pretty, feminine and flatters all skin tones! This necklace such a statement that can add a touch of warm, rosy glam to any basic - I love the cage shape and tassel that flows from it! Hope you enjoyed this small round-up of my current favorite pieces! And with it only being mid-May, there is plenty more to come! Share your favorites with me using the hashtag #clotheinconfidence on Instagram!